So after letting my plan percolate in my mind a bit more, and really liking the direction…and most importantly, after ordering all of my fabrics and other items so that I can’t and won’t change my mind again…I’m ready to share details. 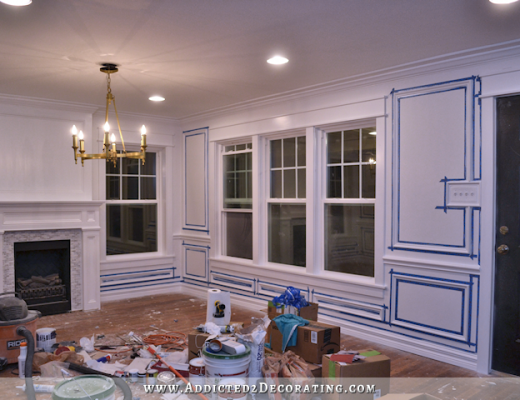 First of all, I’m doing black and white horizontal striped draperies, and I’m doing them on all of the windows. Black and white horizontal striped draperies are what I’ve wanted from the beginning, and somewhere along the way I was talked out of it. It took my sister’s comment on my “Know When To Walk Away” post to snap me out of it. She said, “I think what you really want is to use the wide black and white stripes in there, and you won’t be satisfied until you find a way to do that.” Yep. She knows me well. 🙂 And then either that day or the next day, I was cleaning up and going through my stash of magazines and catalogs that I let pile up, and I came across a Shades of Light catalog from last year with this picture on the cover. 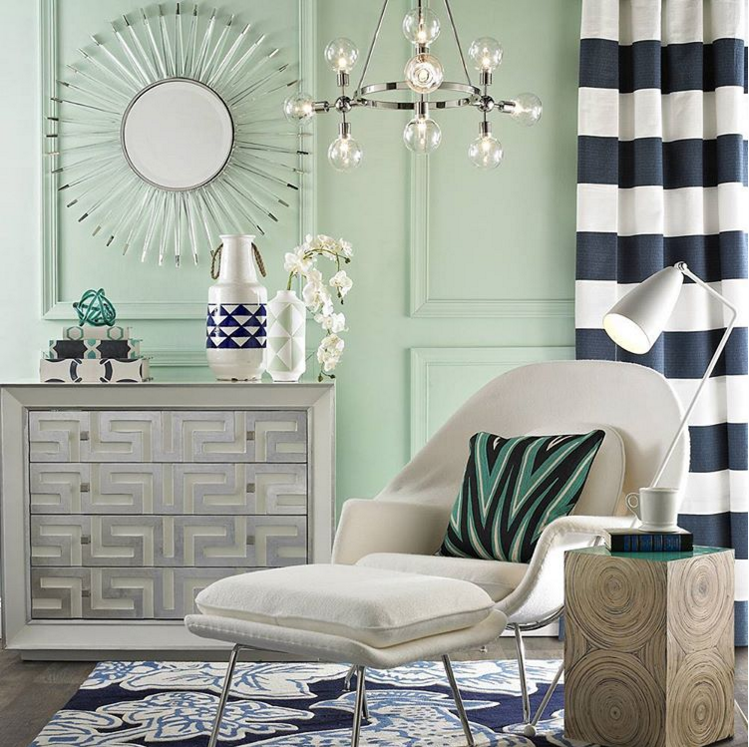 When I came across that catalog (again), that’s when I had my lightbulb moment and decided that white walls were out, and green walls were in for me. And I also decided to stick with what I’ve wanted all along and go with the black and white striped draperies. I ordered 100% linen for my draperies, and found it here for just under $10/yard. It arrived this week, and I bought my drapery lining at Hancock Fabric’s awesome going-out-of-business sale for 70% off. I did go ahead and splurge on the acrylic curtain rods that I wanted. I ordered them on Monday, and they’re supposed to be here either today or tomorrow. As soon as those get here, I can get them installed, measure for draperies, and get started sewing. So where does the coral come in? On my dining room chairs. Those chairs are very sturdy (especially since I glued, clamped, and added new screws on all of them), and they were an incredible bargain at $51 for eight chairs and a dining table. But where I hit my roadblock was in trying to make the cane backs work in the room. 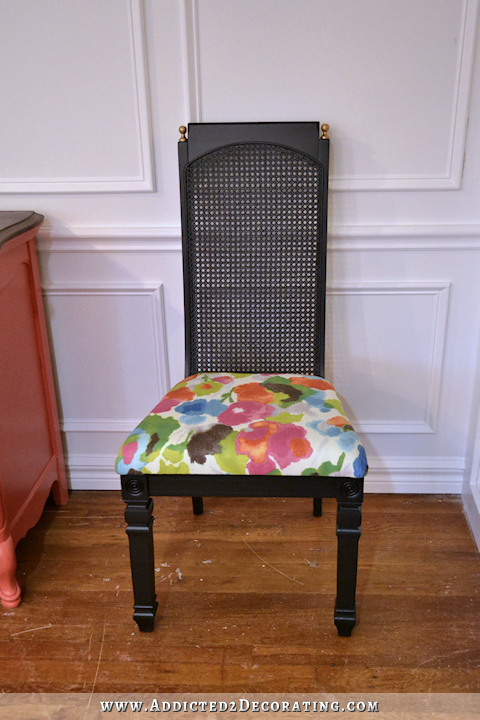 I love the look of the white painted wood and the bright fabric together. If I go this direction, I’ll be using this coral fabric. The color is actually much more vibrant in person, and it almost matched the coral buffet exactly. 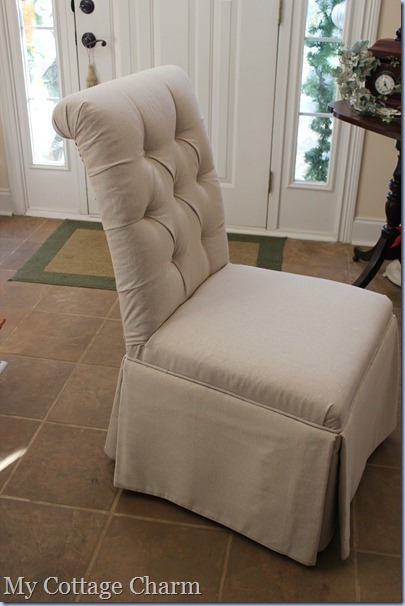 For the host chairs at the dining table, I’m still planning on building those, and I’m still looking for fabric. I want a fabric that will incorporate all of the main colors — black, white, green, coral, and maybe just a touch of yellow. But I want a much more subtle and smaller pattern than the watercolor print that I was originally planning to use. If I can’t find anything (which is probably a long shot), I’ll try my hand at designing my own fabric on Spoonflower. And I think that’s it. 🙂 I’m still looking for the perfect mirror to go over my buffet in the entryway, and I think I have an idea for that. So if my idea works out, I’ll probably have that project to share with you next week. It feels good to finally have a vision for this room, and to actually be making progress! Wow, I love that! I’m still considering the black and white stripes for my music room. I think chairs in black and white, with some really colorful pillows, would look great in there! How about using your chrysanthemum mirror …make a new one in the right colour? Looks perfect! Can’t wait to see it! OMG! I love this mirror, it would be perfect! When I step back and think about all that you do, I am stunned by all the research, blog viewing, Houzz peeping, comparison shopping, in-person shopping – AND all the physical labor AND being a wife with significant responsibilities- PLUS you open yourself up to us to praise, criticize, gab…I would love to meet you in person! And I still wonder how you fit it all in in a 24 hour day. You are the only blogger I would drive hours to see. I might cross the street for a few others, but that’s about it. Sounds great, I love having a clear vision it really makes it easier to go for it and you know you will love it!! I can not wait to see the next steps!! Sounds wonderful! I can’t wait to see it! Yay! I was hopinh you would back to the striped curtains. I think deep down I had an intuition about it 🙂 I can not wait to see the outcome. I adore your blog. My favorite of all time. I’m glad you’re deciding to cover the cane up on the chairs. I think that was the biggest issue I had with the them. The style seemed all wrong with everything else in that room. I love the coral fabric! I can’t wait to see it all pulled together. Hurrah for you! Love everything about the photo on the Shades of Light catalogue, by the way. I’ve saved it. Who knows? Maybe wide black and white stripes are in my future too someday. Jumping for Joy! I love that you have gone back to the stripe draperies. Amazing vision and I’m happy you are following your heart. Love the shades of light photo, more neutrals in the room than is immediately obvious. Like the idea of covering up the chairs. I knew when you had time to sit down, close your eyes and just think about it you would come up with exactly what you wanted. Way to go! I cannot wait to see the finished product. It is going to be amazing. I’m really looking forward to the black and white draperies and was really amazed by the buffet in black. 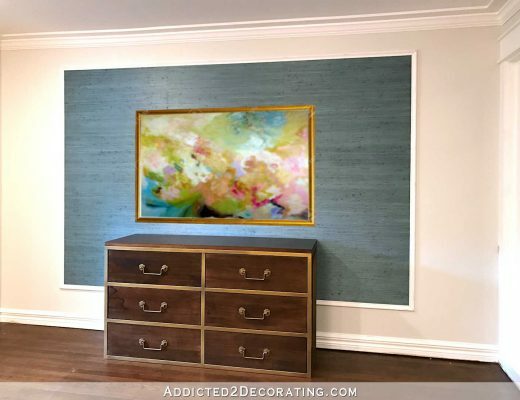 While I liked the coral version, now it looks like something I would put in my own home immediately (just like the striped curtains) 🙂 I’m sure that this room (or rather suite of rooms, including your beautiful music room) will look absolutely stunning when you’ve exceuted these plans! Love the vision you have now. 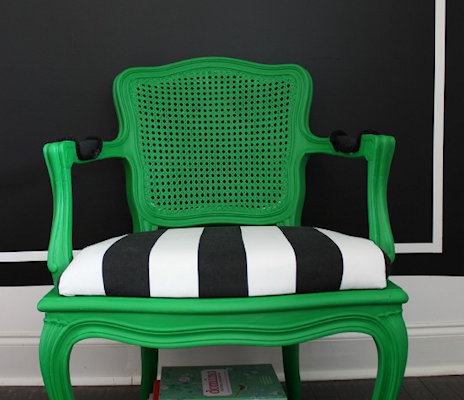 Just wondering if you could still incorporate the cane backs if you upholster the front but leave the backs clear (like in that photo of the green/yellow and white chairs) Would it work with your chairs? Looking forward to seeing what you choose for the captain’s chairs. I’d love it if you did a post on online fabric stores. I wasn’t familiar with either of the ones you used to purchase the linen or coral fabric. I agree with the post on online fabric stores! That would be really helpful for me. Good for you! We all enjoy participating in the process…watching, learning and expressing our opinions…that’s part of the fun..but ultimately, you and your hubby are the ones who live your daily lives within this house…You need to make it your home…and no matter how many times you your design or change your mind…thats YOUR business….It’s what decorators and designers do…it’s part of the creative process and you owe no explanations…Im just glad that your readers and in a way, your students can come along for the ride….as always..can’t wait to see the final result!!! Love all these ideas! I only found your blog recently, and I am so impressed by what you manage to accomplish. I really appreciate the trial and error as well- we all go through it, so it’s nice to see a blogger really go through a thought process! Glad you are marching to your own drum. I think people sometimes feel you want the criticism, when you really may not. You are just showing your thought process,not asking for opinions. While we may like to get input sometimes, for you, as a blogger, I think you get too much and it muddles your mind. Stick with your vision and take the comments only if you agree! I do enjoy seeing how you arrive at your visions nonetheless! And can’t wait to get a post to see where you’re at! Well, Kristi I have no idea what you’re up to here but it will all turn out beautiful & it will be exciting when we get to see the end product. I like the coral fabric. THANK YOU! THANK YOU! THANK YOU! I was more than a little bit disappointed when you told us you were not doing the black and white striped curtains, and I even commented about it! I have been planning on making my own black and white striped curtains for my dining room and wanted to watch your process first. So, I was thrilled when you said you’re going back to them. I haven’t loved the detours you’ve taken to get back to this plan for the dining room, so I of course kept my mouth shut (because, you know, if you don’t have anything nice to say…), but I am taking the time to say FINALLY you’re back to yourself and will create a fabulous dining room. I really love the ‘Shades of Light’ photo, the colors and the styling and I’m so happy that you’ve decided to go with your original idea of black and white horizontal drapes on all your windows. They are going to look absolutely stunning in your dining room! I am really loving your renewed vision, and your color choices and can’t wait to see it all come together! It’s going to look so amazing!!! Bravo Kristi, you never cease to amaze us with your inspiration and creativity. Love black and white striped curtains. So happy you are putting them in again. I used similar style gray and whitell curtains for out house and absolutely love them. They put peppy -ness back into the room. A pop of fun color! I love it! I’m glad I’m not the only one that feels like i get too many opinions from people that won’t be living in the space. You and Matt are the only opinions that matter, and if your Matt is anything like my Matt then he usually likes most of what you do and doesn’t have a strong opinion. Thanks for all the ideas and the inspiration, I can’t wait to see it all together. Oh and thanks for the heads up about Hancock Fabric’s closing, i used to work there with my mom while i was in high school, sad to see it go, but the stores by me haven’t “aged” well. Hurrah! I loved the black and white drapes, and missed them when they left the idea pile. Glad to see them back. 🙂 The coral chairs will look fabulous in that space. Wow, you always amaze me, putting together fabrics and patterns that I would never think of. I really like the curtains and can’t wait to see the chairs all put together. Thanks for all of the inspiration! I would like to invite you to a little Link Party I am hosting on http://www.sledgehammerqueen.com. It’s called Celebrate the Season and your entry way post definitely makes me think of a celebration! If you can’t do this, no problem, but what an awesome addition you would make to our little party, if you can make it. Nevertheless, I am eagerly awaiting the next part of your dining room make-over. Thanks so much! Always enjoy watching you deliberate over choices – move forward – and then not be afraid to change tack when you’re not happy with the initial outcome. I was so sad to get that “going out of business” email from Hancocks earlier this week but not too surprised unfortunately. They closed my local store last year. Our local Joann is also closing soon. Our Walmart closed their fabric department a few years back when they converted to a supercenter and added a grocery. All I can say is, when you finally clear you mind of all the clutter, the right design comes through. Now to get it done! Can’t wait to see the finished room! Woo hoo. So happy to hear you love where you’re going with these rooms! I am excited to see the cane backs getting covered, they will look much more modern and clean. I like the idea of leaving the wood trim (and cute finials) as a border to the upholstery. Have fun and enjoy the process! I am happy you returned to the striped drapes, you loved them from the beginning!! Just wondering, how do you think gold lamps or maybe gold lampshades would look on your buffet? They are pretty! Kristi said she may use her gold starburst mirror above the buffet and doesn’t want too much gold. I think your lamps would look beautiful bc they arent overkill with gold! I am anxious to see the finished room, especially her choice in a carpet. I’m so glad you decided to go back to the black and white stripes for your drapes. It is amazing how quickly this is coming together now that you have the right plan. Loving the new direction, looks great! Can’t wait to see the progression!